← Terrrorism returns to London as brave passerby potentially saves many lives. Today is a big day, the official launch of my second book! 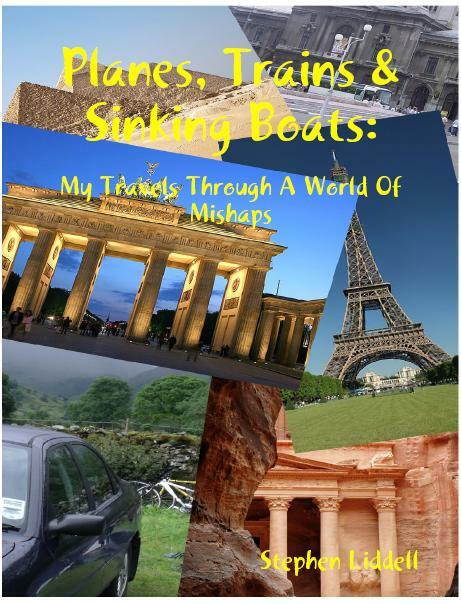 Planes, Trains and Sinking Boats: My Travels Through A World Of Mishaps is a humorous travelogue. I originally started writing it for two main reasons; the first is that writing my first novel Let Me Help was very challenging. It was an epic story with numerous characters and complex plot lines as is befitting a life-story. Additionally as most of it was set outside of England and in various countries it required extra thought to make it authentic especially as all the events that take place in the story actually happened… except for the main character of course! It was very rewarding to write but very tiring too and when writing such a book, it is hard not to get attached to your characters and be happy for them at the good times and get upset when bad things happen to them too. It helped of course that I had studied a lot of what I wrote about for many years but for some aspects of it, such as maps and distances, I had to work it all out for myself. How many days does it take to ride a horse from Mongolia to Iran? Work it out for yourself or read my book! I actually only worked out the final aspects of Let Me Help when I was on one of several backpacking holidays in the Middle-East and it occurred to me that due to the nature of holidays I like to take, that lots of unusual, comedic and plain co-incidences happened to me much more than anyone I know or indeed of anyone who knows anyone who knows me… if you get my drift. It was for this reason that I thought it would be fun to write a travelogue. There was another reason, it would be relatively quick to write, light in nature and a total change of pace from my earlier book. A good writer should be versatile right? That’s what my blog is about. Unless of course I’m a versatile bad writer, that’s entirely possible but no-one ever comments it (good old WordPress for deleting all the Stephen bashers)! So what is in Planes, Trains and Sinking Boats you might well ask? The book is split into a number tales involving different aspects of travelling of which the only thing they have in common is myself and the general craziness of events I often find myself in. Partly through bad luck, partly as I go to places and do things that most people wouldn’t consider and partly as I do everything on a budget. Cover for Amazon Kindle and Ebooks from Apples iStore and Lulu. 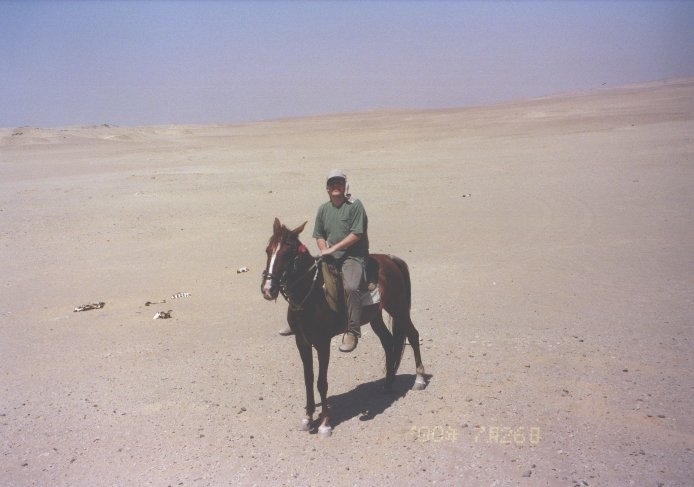 Two of my holiday tales involve two different trips to the Middle-East. One to Egypt and Jordan which has all sorts of scopes for adventures and interesting situations from scorpions in bedrooms to climbing Mount Sinai and having an asthma attack there to spending time with Bedouin in Wadi Rum and sneaking into the Kings throne room to have a picture on King Abdullah’s throne. Maybe that was why I was later taken in by security at the airport! 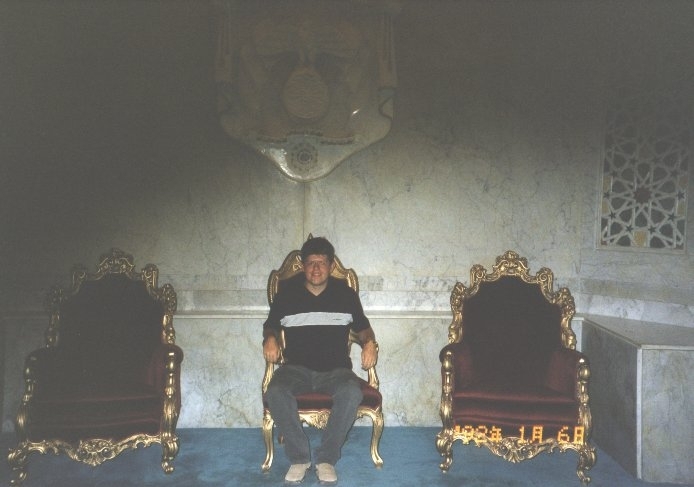 Sat on the throne of King Abdullah of Jordan above the Jordanian parliament where he receives foreign dignitaries. I won’t tell if you won’t. There is another section which I guess almost totally unique is my experience of getting married in Romania, well I guess unique if you’re not Romanian. A tale of madcap trans-continental journeys, inept and racist embassy officials and bribery all against the ticking clock. The second Middle-Eastern adventure is solely within Egypt but doing totally different things and visiting different sites and meeting different people. Some of the highlights include sinking on the Nile twice which was made worse by the surrounding crocodiles and the fact that I can’t swim. Standing up to gun-toting police wanting money at the isolated Red Pyramid, having our jeep commandeered by an Egyptian soldier on a day trip and getting lost in the poorest part of Alexandria where the animals either lived in towerblock balconies or being slaughtered on the streets by the residents, many of whom seemed to be carrying daggers and swords in their hands. It’s not all deserts though; I show that despite Prague being widely praised as one of the most beautiful places in the world that I found it truly awful in more ways than one and is actually the only place I have visited where I wouldn’t want to return. You can’t have a travelogue with a camping trip, I wish I could but I can’t. Camping might be fun where you live but not so much if you camp at the wettest spot in Britain during the wettest summer in history. Midges and attacks on our tent by rampaging sheep are just some of the problems we faced in the only holiday I have ever been forced to abandon. Whether it is being on top of the steel Eiffel Tower the only day in its history that it was savaged by fire, having your car literally blow up on a motorway of accidentally wondering through a lost WW1 trench system and walking through and getting stuck in German mine-field, Planes Trains and Sinking Boats has all the travel experiences that you never want to encounter. The book is available on Kindle from all the Amazon UK USA sites and will very shortly be available on the Apple iTunes iBookshelf for use with iPhones, iPod Touch and iPads. A paperback copy is for sale at Lulu and going to be available very soon on Amazon and the bigger bookstores in a few weeks time but is available now from the publisher’s website. To celebrate my new book I am going to be running a competition and a few special offers for everyone who is following my blog. I have compiled a list of 100 of my must see sights, some of which I have seen and some I haven’t. The reader who can guess what is number 1 on my list will receive a free signed paperback copy of Planes, Trains and Sinking Boats. If no-one can guess number 1 then the person whose guess is highest on my list will receive a free e-book. I am going to release my list of tourist sites over the coming weeks. I mentioned some special offers and here are the first of them. For the next 100 days anyone who follows my blog and purchases either Let Me Help or Planes, Trains and Sinking Boats on Amazon Kindle or in E-book format from Lulu or iTunes iBooks then I will send you a free E-book of the other title, just email me a screen dump proof of purchase. I’d like to thank everyone for all their support with my blog and I hope that if you like my writing on-line then you’ll like my books too. 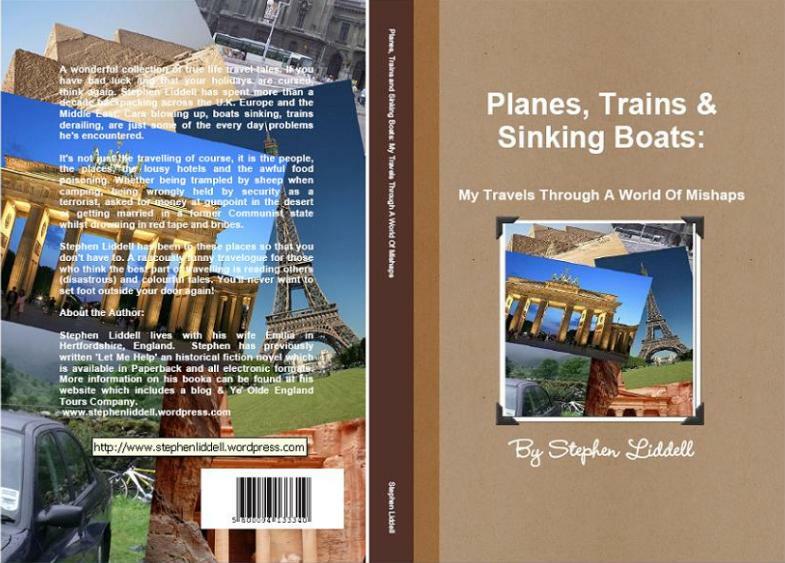 I will start my listing of my top 100 tourist sites in the next few days so be ready to think of my most must-see destination to win a free paperback or e-book version of Planes Trains and Sinking Boats: My Travels Through A World Of Mishaps. This entry was posted in writing and tagged books, Competition, E-Books, Historical Fiction, Kindle, Life, Literature, New book launch, Special Offers, Travel, Travelogue, UK, writing. Bookmark the permalink. 22 Responses to New book launch Planes Traines and Sinking Boats + Special Offers and Competition give-away! Wishing you success with the new book! Sounds like something great to take with me on the plane across the Atlantic. Will you give a heads up when it is available on ibooks? Thanks. Yes I will. I am hoping that by the time my competition ends it will be on ibooks and will give updates as the various editions become available. There is nothing to get you in the mood for a holiday than reading of someone elses! It is still going through the iTunes channels but if you go to Lulu and try and Ebook version, your Apple device will automatically read it as as iBook once you open it for the first time. I just tried it and it works ok for me. Apparently Kindle files from Amazon can also be converted to Apple ebook files but you have to do something manually to the file which sounds a bit too much like hard work to me! Sounds like a rip-roaring read! I wish you the best of success with it. Thank-you. I’m already getting some good feedback and sales so I hope it will be a success. Thank-you. I don’t have a Kindle either, my house would be empty if I did but then maybe that is the attraction of them too. It should be on Amazon and other sites in paperback soon as well as the publishers. Thanks for your support! I brought it on Kindle! Awesome book! I’m so glad that you like it. It makes all the work worth it and it’s nice to have some take the time and give good feedback. I really appreciate it as most independent authors though aren’t in it for the money only make sales from good word of mouth. Thanks for cheerleading me on Twitter 🙂 I will email you a copy of Let Me Help ASAP! I posted a review of it on amazon. It usually takes 48 hours to appear. So keep checking. Thanks for the email and I look forward to reading your other book. Thank-you so much for your support and best wishes, I greatly appreciate it. You’ve had some amazing adventures! I’d very much like to read your book. I wish you great success! Great stuff and all the best for the book! Can’t wait to read it! I’m excited to read about your travels and anticipate I’ll be laughing out loud and the stories you have to share. You write with such wit, sometimes I can’t help but crack up!! Thanks so much. I think you will love it then as everyone who has read extracts have started laughing like crazy!